Star Crossed Stitch quilt - done! Thank you all so much for your support last week when I was unquilting this quilt and trying something new. 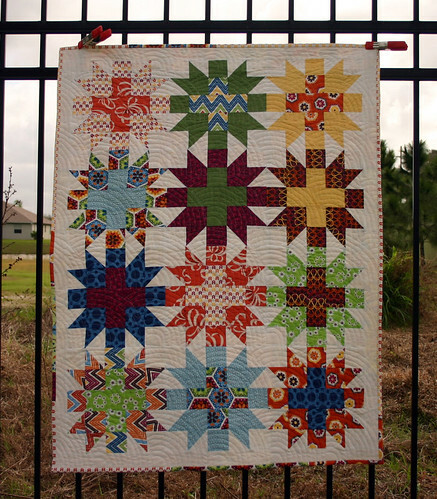 I am so excited to share the finished quilt with you! This is definitely one of my favorite finishes in a while, thanks to the fun I had quilting this one and the great texture the quilting created. 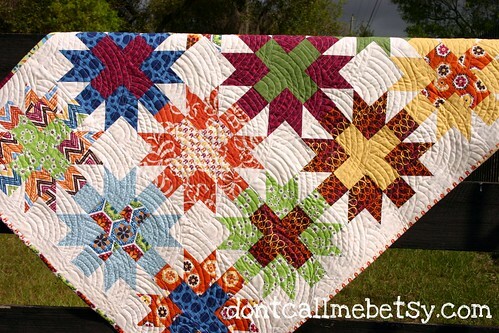 I love densely quilted quilts like this one, so I'm quite sure it's going to be one of my favorites for a while to come. A while back, I fell in love with a block I saw in a copy of Jinny Beyer's The Quilter's Album of Patchwork Patterns, on loan from the library, and sketched it out in my sketchbook. Many months later, back in January, when the fabulously talented Betz White sent me some of her fantastic organic line of fabric for Robert Kaufman, I revisited the sketch and decided to finally make the block. 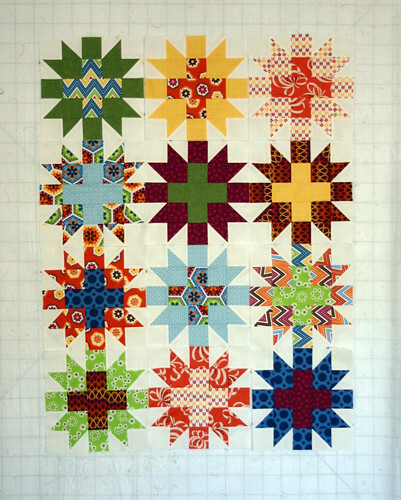 I called it a Star Crossed block, as it felt like a fab combination of a star and cross block, and I slowly started working on this quilt bit by bit, in between what feels like a zillion other obligations that I can't share yet. Somehow or another, I got baptist fans on the brain, and just couldn't let go. So I did them. And they were really fun to do! The way I stitched these fans is indeed in a continuous line, with one start at the beginning of each row of fans and one stop at the end. I'm putting the finishing touches on a tutorial of how I did this quilting to share with you all tomorrow, so stay tuned for that. I'm so happy I went with my gut and ripped out the pointy stipple quilting stitches I started with. I'm also really glad I tried a new style of quilting, even though I really thought it was going to be either too difficult or too tedious. Trying something new can be so much fun! 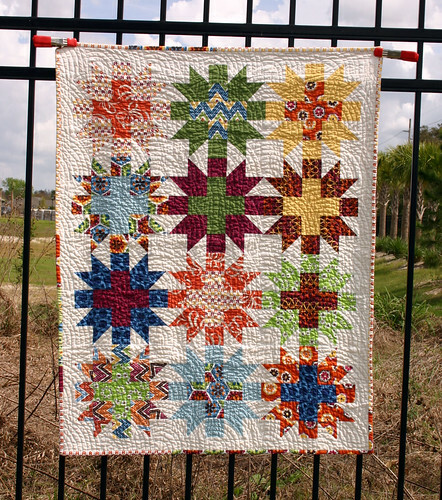 Thanks again, Betz, for sharing some of your lovely fabrics for this project! 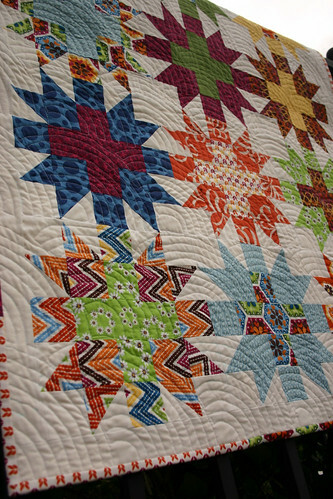 I really love how these blocks work together and create wonderful shapes throughout the quilt, which makes me want to skip sashing it, but at the same time, I would like to make it a little larger. 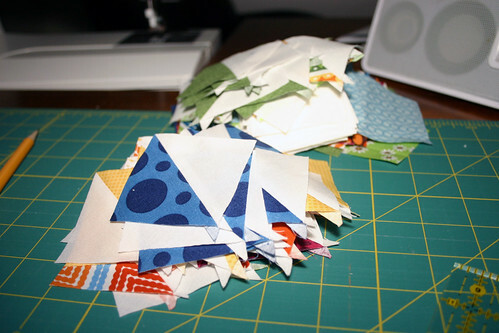 I'm pretty sure I will add borders so I can keep the binding off of the blocks themselves. Binding is something else I need to tackle for this quilt, too. I'm really happy with how it's coming together, finally, and it feels great to finally have something I can share!! I hope you're all having a great Monday! Did you really think I'd watch the Super Bowl? In the 4x5 bee, life got in the way, so to speak, for one of our caretakers, so Amy and I are working on angel blocks for the members of that hive. We chose Faith's Star block pattern for them, and after an intense round of rock paper scissors, I wound up making two blocks, for Rhonda and Jessica. 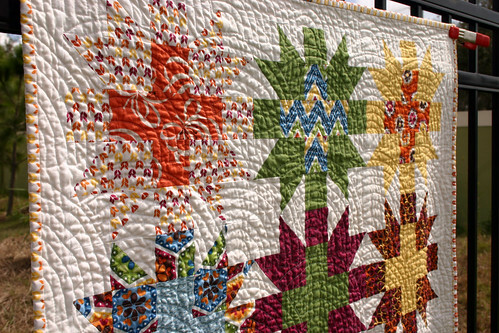 Rhonda asked for rainbow fabrics for her block, which was somewhat of a challenge with this block. Ultimately, I decided to split up the rainbow into warm and cool colors and throw in some gray for a neutral to tie it all together. I'm not too sure it really works, honestly, it feels a little haphazard, but I'm hoping that Rhonda digs it. 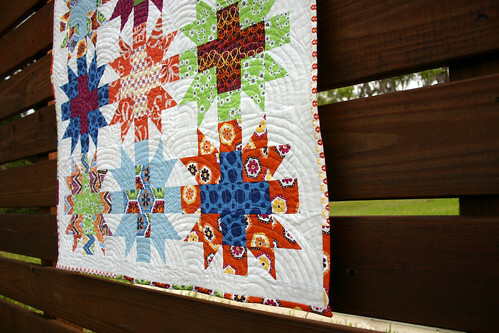 Jessica asked for aqua, gray and orange for her block, and I dug out some Heirloom scraps for her. I'm happier with how her block turned out, even though it is awfully scrappy, it feels a bit more unified and well thought out. I think I may have forgotten to share with you the lovely blocks I received in this first quarter of the 4x5 bee - look at all these lovelies!! There were some wonderfully talented people in my hive, so I was really happy with each and every block I received. I also finished up ironing and cutting my fabrics for my Stitch quilt last night, so I'm looking forward to getting some more of my Star Crossed blocks done this week. So many HSTs!! I trimmed these while I watched my first episode of Downton Abbey (love it already!! ), so that made it a much more bearable task. I'll leave you this morning with a sneak peek of the mini I'll be sharing with you all on Friday as a part of Jennifer's Modern Mini Challenge!